Popular Protest in China merges the study of popular protest, an academic field in its own right, with mainstream China studies scholarship. 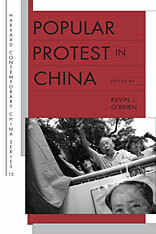 Beyond the details of the book, the publication of this volume reflects “the mainstreaming of China studies” (p. 24), whereby traditional study of Chinese contention is appropriating popular protest paradigms and vocabulary and testing hypotheses about contentious politics is considering the China case. Political opportunity refers to exogenous factors, usually political institutions or patterns of political action, that create space for political contention. Mobilizing structures can be defined as “the ties that connect individuals to groups that organize action” (p. 17), including, in the China case, includes NGOs, community associations, and personal relationships. This is in contrast to democracies where professional activists usually coordinate mobilizing structures. Collective action frames are “shared understandings of a problem and a possible solution” (p. 19). These frames, if accepted, legitimize the claims of a contentious group and can draw support. All three are uniquely adapted to China’s illiberal environment by the authors in Popular Protests in China, demonstrating the need to adjust our understanding of popular protest based on time and place. Teresa Wright compares the student movements in China and Taiwan, in the years 1989 and 1990 respectively. Illiberal opportunity structures made mobilization difficult due to a high level of distrust. Opportunities in both cases included a single party state, official control of information flow, official control of social organizations, and a disposition toward coercion. Wright demonstrates that this forced students to rely on pre-existing friendships to organize the movement and also, more importantly, that state oppression bred extremism among the students while state concessions buoyed students calling for moderation. In illiberal circumstances, the perception of political opportunity affects the character of mobilization. Xi Chen’s chapter, “Collective Petitioning and Institutional Conversion,” argues that “[s]tate authorization and facilitation are especially important in high-capacity authoritarian regimes where the state controls most resources for mobilization” (p. 54). What he means is that, in cases such as China, bottom-up mobilization is not as effective as inside-out mobilization. He uses the concept of “institutional amphibiousness” to describe the process wherein locals use the system itself for popular mobilization. Examples include the xinfang system designed for petitioning the government to redress wrongs and appealing to higher government authorities to force the hand of lower-level authorities closer to the situation. William Hurst examines worker protests by using a “mass framing” approach that focuses more on structural factors than agency. He contrasts mass framing with “elite frames” that are shaped by leaders or organizations, but these tend to be dominant in contexts where social movement organizations operate freely (p. 84). Mass frames, on the other hand, are “not shaped by leaders or organizations but rather are widely held by people in similar social, political, and economic contexts” (p. 84). Hurst argues that a Chinese worker’s choice of a mass frame of “Maoist moral economy” or “market hegemony” varies by regional political economy, rather than a class-wide consensus. Those benefiting from market reforms adopt a “market hegemony” mass frame and unemployment is less likely to spark mobilization. The opposite holds for regions that benefited from Maoist economic policies. In healthy tension with Hurst’s “mass framing” is Feng Chen’s investigation of the role worker leaders have in framing factory-based resistance. Chen focuses on the way leaders’ biographic details shape their framing. What we find is that Maoist-oriented frames are enforced and constrained by history and an official rhetoric still steeped in socialism. Thus, these are the tools that worker leaders have to work with–they lack alternative frameworks. Carsten Vala and Kevin O’Brien consider the recruitment to Protestant house churches and argue for the critical role social networks play in mobilization. They explain that “social bonds with the already mobilized can create a context for new identities to emerge” (p. 109). As friendships are created, the uninitiated discuss unfamiliar ideas and the process toward making a decision is more comfortable. The process of socialization described by Vala and O’Brien is not uncommon from what occurs in the United States or other countries with large numbers of evangelical Christians. The chapter could have spent more time considering the role of illiberal regimes in shaping the way proselytization is done through discrete or non-discrete methods. Internet contention, a very popular topic among China watchers, is covered by Guobin Yang. He lists three characteristics of Internet contention in China: (1) symbolic and discursive, (2) reactive, episodic, and quick to diffuse, and (3) especially prominent regarding three issues–neonationalism, rights of the disempowered, and social injustice committed by the powerful (p. 129). Yang has three conclusions. First, Internet activism shapes policies or behaviors that come under fire. Second, Internet contention can experience a “boomerang” effect whereby it both responds to mass media, but also shapes it by influencing the international media newscycle. Third, the Internet has become new ground for protest. Yanfei Sun and Dingxin Zhao draw lessons from environmental campaigns conducted by environmental NGOs (ENGOs). They compare a campaign for saving the snub-nosed monkey and the Tibetan antelope with protesting the construction of a dam on the Nujiang. The latter was a much more difficult battle than the former. Sun and Zhao attribute this difference to changing state-society relations. The animal preservation cases occurred when the state-society relationship led ENGOs to take up less politically-sensitive causes, whereas the ENGOs took up more contentious issues after an institutional change in state regulations, which injected a boost of confidence. In addition, who has the power to frame and the shape the frame takes is more important than the issue itself. The pro-dam coalition shifted its framing from an energy-generating paradigm to combating poverty and protecting the environment. Yongshun Cai investigates the central government-local government divide that creates political opportunities. Protests can garner attention from the center by high participant numbers, media coverage, and even casualties. Local governments are more likely to make concessions under threat of intervention from a higher authority. Intervention, however, does not protect protesters from being punished. This is concession with punishment. Cai also considers the limits of repression–repression may instigate tactical escalation (p. 176-177). Patricia Thornton addresses top-down manufacturing of dissent from outside of China proper. She specifically describes the use of the Internet by the Supreme Master Ching Hai World Society, Zhong Gong (a syncretic Qigong sect), and Falun Dafa. Thornton shows that oftentimes, rather than eliciting transnational support through their media and lobbying efforts, they have backfired and revealed that they misrepresent the views of their constituents or in fact have less grassroots support than portrayed. Cyberspace simultaneously offers new space for framing, but also can mask “the differences between genuine and manufactured forms of dissent and between mainstream and marginal activism” (p. 203). So to what extent are protests today similar or different from those in China’s history? Elizabeth J. Perry finds that contemporary protests are limited in nature, in stark contrast with former Chinese rebellions. Think of the Red Turban Army that established the Ming Dynasty, the Taipings, or the 1911 Republican Revolution, as representative examples of the political instability created by China’s history of decentralized government. The change occurred, Perry argues, with Mao. She writes, “Having discovered firsthand the recipe for revolutionary success, which involved mixing previously isolated social elements, Mao lost little time in ensuring that his formula would not be repeated” (p. 208). Maoist institutions both energize popular mobilization, but also isolate different elements to prevent capable coalitions. At the same time, Perry notes the differences we see today in the use of electronic technology, the role lawyers play in framing, and intellectual activism. With some reluctance, Perry admits that “contemporary patterns of protest–still animated by a widespread appreciation of ‘the right to rebel’–are more system-supportive than system-subversive” (p. 214). While being an anthology, Kevin O’Brien has done an admirable job in editing a volume whose authors have conversations with one another. It is not uncommon in the book to see authors referencing other chapters in the book, which only adds to the thick texture and sophistication that Popular Protest in China brings to the table. The prologue, introduction, and conclusion chapters tie together the various permutations of the political process model found throughout the book. While most anthologies are read piecemeal, there is merit in reading this book cover-to-cover. Doing so allows readers to see protest in China in comparative perspective. Popular Protest in China targets an academically-minded audience. This means that theoretical concepts are sometimes not explained for the general interest reader. A careful reading of the introduction is necessary for the general interest reader to have a basic grasp of the framework being used. Those who make the arduous trek through this at times dense book will be well-rewarded with a perspective that is careful not to paint with broad brushstrokes when discussing protests in China. Time and place matter. Political opportunities can shift by the day. Mobilization structures vary and even the nature of framing is up for competition. Understanding protest in China as a monolithic phenomenon is woefully inadequate and must be treated with a dose of Popular Protest in China. Kendrick Kuo is pursuing graduate studies in International Affairs at Johns Hopkins University and received his BA in International Affairs and Religion from The George Washington University. He has published in the Journal of Muslim Minority Affairs and the Journal of International Peace Operations. Kendrick blogs at The Asian Crescent. Kendrick Kuo is pursuing graduate studies in International Affairs at Johns Hopkins University and received his BA in International Affairs and Religion from the George Washington University. Kendrick is a contributor at Registan.net and blogs at The Asian Crescent.